This is the story of Shina Rambo - a notorious armed robber who murdered, stole and committed all sorts of vile crimes before becoming a man of God. Once upon a time, the mention of the name Shina Rambo sent shivers down the spines of many Nigerians. Rambo was a notorious armed robber who terrorized people, that even police officers were were afraid of him. He was said to have murdered, robbed and left behind a history of terror that will take years to erase. For history sake, the life of the notorious armed robber who later became a pastor has been brought back for all to read and learn. 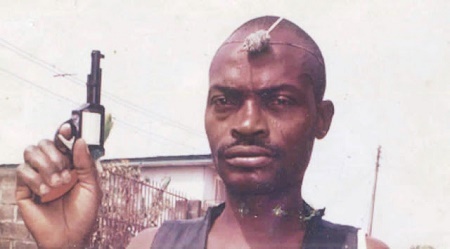 Shina Rambo is a former bandit who terrorised South-West Nigeria in the 1990s. After serving jail-time for his crimes, he was converted by an evangelist and became a Christian evangelical pastor. Shina Rambo now Mathew Oluwanifemi was a name that sent shivers down the spine of people who lived in the South West of Nigeria and even outside Nigeria, like Benin Republic and neighborhood, in the 1990s. He was a hardened criminal, a terror and killer, one whom men of the security agencies will never forget in a haste. He was born in the year 1958 to a military man who was a bad egg in the service. His father was from Abeokuta in Ogun state, but his mother was a native of Sabongida–Ora in Edo state. His father had over 18 wives, as was the norm for soldiers to impregnate virtually every woman they met where they were posted to. His father used his military influence to rob innocent citizens, and always brought huge amount of money home. This used to entice little Shina. He recalls, “I remembered when I was about 7 years old, my father came home with a lot of money, foreign currencies, with blood on it, and they were using something like a woman’s scarf to wipe it, then I asked him, is this an animal’s blood, or human blood? But he wouldn’t answer me, they were just drinking, smoking, and merry making." Shina was already indoctrinated into the underworld by his father at a tender age of 7 without him knowing it, as he would sit in front of his son, to dismantle and assemble all sorts of weapons and then polishing them in preparation for an operation. This went on for so long till one day, little Shina, entered into his father’s room while he had stepped into the toilet, and saw a dismembered gun on the floor. He sat down in front of it, and bit by bit, he had assembled it effortlessly in no time at all. His father came out of the toilet, and saw his son, with a loaded gun in his hands. Shina flashed back and said, “That day my father was so disappointed, that he wanted to kill me, he grabbed the gun from my hand and shot straight at me, but I miraculously escaped out of the room. Then he waited for me to be less alert at night he came to my room with a machete and tried to behead me, but once again, I escaped, but the machete caught my left leg (he rolled up his trouser to show us the large scar, that made everyone sighed in pity). It cut me so deep I thought I was never going to walk again. "That day I knew I had graduated, all that was left was to pull the trigger, and I was so eager." Shina Rambo became so notorious in no time, and was hellbent on succeeding in his career as an armed robber, that he went through any length to secure spiritual powers for fortification. To the extent of pounding over 27 live new born babies in the mortar with a pestle, cutting off about 100 human tongues and cooking them to eat, visiting the spiritual river called river of life in Ogoja, Cross Rivers State, living in an Iroko tree for days, and sleeping in the cemetery. He was given a spiritual wife who always followed him for any operation, she dressed like an Alhaja, people thought she was human, but she was a spirit, that was why they never saw her face. He said she was his personal driver, that she could drive from Nigeria to Cotonou, in the speed of light. Hear him. ”I was involved in so many rituals, that I can’t start naming them now, I was so powerful, I went underground, inside trees that looked like a city, a lot of beautiful houses inside the tree, I had my own too. I went into a river called River of life in Ogoja, where a lot of politicians and wealthy men used to come. I had several personalities, I could change my form whenever I wanted to, that’s why the police were busy killing innocent people, and thought they were killing Shina Rambo. "The 9 herbalists that gave me that power, I became stronger than them, one day I went to their shrines, and killed all of them, so that they don’t reveal my secrets. I had too many powers; my spiritual wife could drive any car in this world or out of it, no police vehicle, or anyone for that matter, could ever chase and catch me during an operation. She was out of this world, and when she had completed her operation, they took her away from me. I could give anything to get powers, and the elders knew, so they also gave me anything I wanted. I once beheaded hundred men, and gave them the heads fresh, they were so happy with me that they made me invincible. "No matter the kind of bullet you shot at me, it was just like pure water on my body. I could give anything to get power, but of all the things I did to get power, the one that still breaks my heart the most, is sleeping with my mother. My father is dead now, but my mother is still alive, and she lives with me she is 85 years old. Whenever I set my eyes on her, I just start crying. I can't bear it. " Shina Rambo was a raging terror, he was infallibly dangerous, the police dreaded him, both in Nigeria, and Benin Republic, his place of interest for business. He would go to police stations, in broad daylight and kill every policeman there, drive to check points and open fire on every policeman on duty, he didn’t like the police at all, and was never afraid of them, he operated in broad day light armed to the teeth looking like Johny Rambo, in the popular Sylvester Stalone movie, “First Blood”. He once robbed 40 exotic cars in one day and drove all of them in a convoy, from Lagos to Cotonou, unstopped. He was powerful; he was wealthy, and impenetrable. He was a tin god, apparently belched from the very arroyo hell, we all dreaded him. He had a wife and three children, but he lost all of them in one day during a bloody police raid whilst he was away on operation. His wife was his stabilizing factor his life changed afterwards. He says “my wife was everything to me, I was forbidden by the elders to sleep with any other woman apart from her. I could gather about 50 women around me in a hotel, and they will just be playing with me. We would smoke, drink, and sniff cocaine, I will give them money but I will never sleep with them. I will go back home to my wife and sleep with her. That was why the police never caught me. She knew my job, she knew what I was and I never left them alone at night, I operated in the day time and go back home to my family at night. 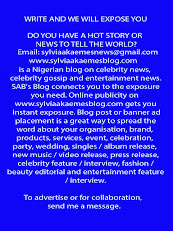 "I had everything, I was very wealthy, I sometimes spent 50 million naira in a day, I did that a lot. There was one day that we were coming from an operation and it seemed as if my powers were going to fail me, the police and the army were almost closing in on us, so we had to drive into a crowd and threw millions of naira in the air, there was commotion, everybody was busy picking naira notes even the police, until we escaped. "I was too rich, but anything the devil gives you never lasts, he will collect more from you, it’s only the devil that will give you Fila, (cap) and ask for Iro and Buba (wrapper and top). I lost everything, all the money, my family; I was so powerful the police couldn’t catch me but I lost it all. I had to surrender myself to the police and I was arrested and jailed for 11 years. "While I was serving my jail term in Agodi prisons, Ibadan, Prophet T.O Obadare came visiting, and having been encouraged several times by the Christian brothers and sisters in the prison to give my life to Christ, he prayed for me and converted me, and changed my name to Oluwanifemi, and it was so miraculous, the next day I woke up and started speaking in tongues. It was during the time of President Olusegun Obasanjo, that we were granted freedom. "At this point, I was glued to my seat, the revival where Shina Rambo gave this exclusive confession was on an open ground revival in the ancient city of Ibadan. 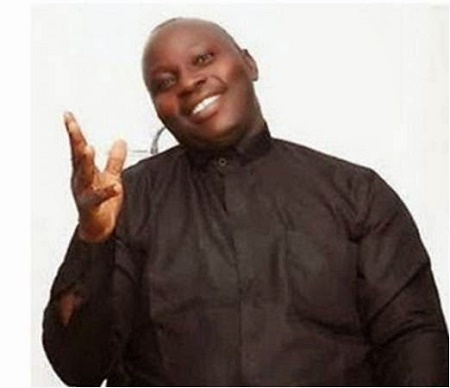 Right in front of me, on stage, was Evangelist Mathew Oluwanifemi, the once feared Shina Rambo, clad in a loose fitting shirt, black pants and a pair of leather sandals with a black Holy Bible in his hands, gigantic dark skinned and bald headed, still had those fiery looks, and stealth movement. "I was more transfixed than focused, God is indeed awesome, he picked the offering basket raised it to the congregation prayed and asked who had anything. "To give to God, at first I was reluctant, my mind was occupied and out of an innate compulsion, sheer curiosity I stood up, dipped my hand in my pocket walked towards him briskly and calculatedly brought out my offering, dropped it into the basket, and looked deep into his eyes, I had too many things to ask him, there were too many questions unanswered. He looked back at me, and spoke in Yoruba, saying 'God bless you my brother; we know your type when we see them. "The congregation broke into a mild giggle, as all eyes were on me as I went back to my seat, with a lot of things on my mind, and the red light on my midget still blinking, in the breast pocket of my jacket," Rambo narrated. God is indeed wonderful. He has sent many people to their early grave without repentant of their sins. They will go to hell and him having given his life to Christ will go to heaven when he dies.